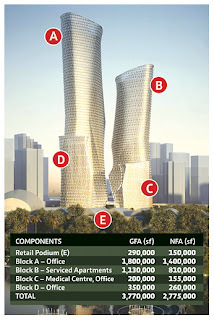 KUALA LUMPUR: Tradewinds Corp Bhd (TCB) will demolish the Crowne Plaza Mutiara Kuala Lumpur and Kompleks Antarabangsa as early as the first quarter of 2013 to build a RM6 billion Tradewinds Centre. To be located on a 2.8ha site, the project with four towers and a retail podium, will have a total gross floor area of 3.77 million sq ft and a net floor area of 2.78 million sq ft. The whole project will be completed in 2019. 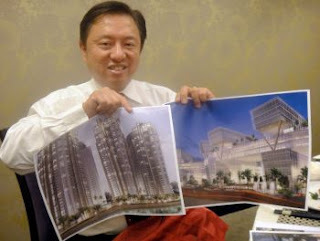 “The buildings (along Jalan Sultan Ismail) will be demolished in the first quarter of 2013 or early part of the second quarter,” group chief executive officer Shaharul Farez Hassan said. Shaharul said Crowne Plaza’s last day of operations will be on January 2 next year and that TCB is in negotiations with hotel operator InterContinental Hotels Group (IHG) on ending the management contract ahead of its term. It is understood that Crowne Plaza held a townhall session yesterday to notify its staff on the last day of operations. Shaharul said financing for the project would be from a combination of debt and equity. “We will fund it with debt and equity. We are in talks with key bankers,” he said, adding that the ratio would be 70:30. Another redevelopment by TCB is the Mutiara Burau Bay Resort in Langkawi, which will close in the first quarter next year. The hotel is slated for a makeover that would push it to a five-star property from three-starTCB will spend about RM200 million to develop the property, targeted for completion in three years. TCB, which has been the operator of Mutiara Burau Bay for Langkawi Development Authority, will now lease the land and build its own hotel. It plans to hire a third party to manage the property. TCB has refurbished some of its hotels to cushion the impact of the closures of Kompleks Antarabangsa, Crowne Plaza, Mutiara Burau Bay and Menara Tun Razak (MTR). The latter building at Jalan Raja Laut in Kuala Lumpur will be upgraded to a Grade A office building. Refurbishing efforts include renovating the Meritus Pelangi Beach Resort and Spa for an estimated RM60 million, Hilton Petaling Jaya (RM50 million), Hilton Kuching and Hotel Istana. Shaharul, who spoke to reporters after TCB's annual general meeting yesterday, said the upgrading of MTR will help double its per sq ft rent to RM7 from RM3.50. The block is expected to be completed by end-2014. A new tower called MTR2, to be built adjacent to MTR , has been sold to Tradewinds (M) Bhd for RM510 million. On reports that TCB is interested in buying Bukit Bintang Plaza to accommodate the MY Rapid Transit (MRT) station, chairman Tan Sri Megat Najmuddin Megat Khas said: "We are in talks (with UDA Holdings Bhd), but nothing concrete has come out of it." TCB also said that it is unlikely that anything will happen soon to its planned redevelopment of Hotel Istana. Low showing an artist impression of the Penang World City project. IMPACTED by high-land cost in Penang, Ivory Properties Group Bhd will focus on building high-rise properties on the island. Group chairman and chief executive officer Datuk Low Eng Hock says the price of landed properties may be beyond the affordability of most due to exorbitant land prices. ”We hardly come by a big parcel of land to plan for landed projects on the island. Most are pockets of land suitable for high rise development. ”We don't think planning for landed properties will work; the property prices will be very expensive,” Low adds. The cost of a plot of net land in a prime area like Pulau Tikus is between RM500 and RM600 per sq ft. In Tanjung Bungah and Batu Ferringhi, land is priced between RM300 to RM400 per sq ft, while in the South-West district it is between RM100 and RM200 per sq ft. The land price today is about 20% more than a year ago. These are some of the key projects that will spur the growth of the group over the next five years. Last year, Ivory acquired the 102.56 acres for the PWC project for RM1.072bil and 2.4 acres for The City Mall and City Residence in Tanjung Tokong for RM40mil. The 1.1 acres for the The Bay project in Batu Ferringhi was acquired for RM25mil in 2010. Despite the high land cost, Ivory plans to keep a percentage of the properties affordable. The first phase of the PWC project on a 10-acre site, with an RM800mil gross development value, comprises approximately 1,500 condominium units, of which about 15% will be affordably priced between RM300,000 and RM500,000 for units with built-up areas of 600 sq ft and 800 sq ft.
“Subsequent phases for PWC will also see 15% of the properties priced in the affordable range of between RM300,000 and RM500,000. These units were in the entire master plan as a value-added component from the very early stage, even during the tender exercise for the project,” Low adds. Low says the group also wants to position The Bay project as a medium to high-end scheme, as investors' preference for luxurious super-condominiums has dried up. As for the City Mall and City Residence project, the plan is to develop 80% residential units and 20% of three-storey commercial lots. “We are looking at selling the City Mall and City Residence units each for between RM700,000 and RM750,000. The City Mall will have a gross built-up area of 600,000 sq ft. For the residential towers for Penang Times Square, there will be 700 condominium units of various sizes, ranging from 400 sq ft to 1,200 sq ft,” he says. To differentiate Ivory from its competitors, Low says the group will use architectural and cultural themes of a particular country in the Penang World City project. .
“As we are planning for a world class city within PWC. Economies of scale is of the essence. We need a huge number of Penangites to call Penang World City their home. That is why PWC has affordable components,,” he says. There would be Chinese, Korean, Middle Eastern and European villages in PWC, so that the properties can be marketed in that particular country through an appointed real estate agent, he says. “We want to create a world culture in order to attract tourism and foreign investors and to differentiate PWC from the other mega-development projects on the island. These parcels will be solely for en-bloc sales to expatriates,” he says. Last July, Ivory won the right from Penang Development Corporation to purchase and develop the PWC project in Bayan Mutiara after edging out four other parties, including SP Setia Bhd,. Ivory offered RM240 per sq ft or RM1.072bil for the entire site, the highest, , securing with it the right to develop on the existing 67.56-acre site and another 35 acres that will be reclaimed over the next three years. Tropicana Ivory Sdn Bhd, a joint-venture company in which Dijaya Corporation Bhd holds a 55% stake, and Ivory Properties Group Bhd the remaining 45%, is the developer of the PWC project. On the City Mall and City Residence, he says the residential components will sit above the retail outlets. It will have an open tropical style interior design featuring giant palm trees, water features with lots of natural lighting, to blend with the architectural design of the residential component,” he adds. PROPERTY developer KSL Holdings Bhd is yet to receive building approval for its proposed 10-storey high-end condominium development in Jalan Madge off Jalan U-Thant, Kuala Lumpur. The project has been on KSL's plans as far back as 2010, a company official said, who declined to put a timeline on the possible approval. KSL first obtained the project's land in June 2010 for RM24.5 million. Meanwhile, the company yesterday told its shareholders it would not be paying out dividends this year in a move to cut its gearing level. KSL executive chairman Ku Hwa Seng said while it was a bitter pill for the shareholders to swallow, the management believes it was in the best interest of the company. KSL has some RM243 million in borrowings, while cash stood at negative RM582,000. Ku told Business Times the company hopes to shave off about RM100 million off its borrowings. On its biggest project KSL City, Ku said the 868-room KSL Resort is currently 70 per cent completed, while KSL City Mall is 85 per cent occupied. The average room rate (ARR) at KSL Resort is between RM150 and RM160 currently, at promotional rates. Ku is confident that the ARR will reach RM200 at the end of the promotional period at end-July. Next week, the developer with land mainly in Johor will launch phase one of its RM2.5 billion Bandar Bestari mixed development project in Klang. The project will have a gross development value of RM200 million. KSL has some 800ha of undeveloped land bank and is still on the look out for more land, Ku said. SELLING a house, even in a stable property market, can be quite a challenge. But what if the home you’re trying to dispose of happens to be haunted? It’s not a common occurrence, but once in a while, you (or someone you know) may end up running into a property transaction where the house was the scene of a horrific crime and is now home to some ghostly inhabitants. According to an article by US-based Realtor Magazine, haunted properties fall within the category of “stigmatised properties,” or real estate that is not defective in any physical manner, but due to psychological or emotional factors, may have a reduced value. Among the situations covered under the title of “stigmatised” is a property that was the site of a murder, suicide, alleged haunting, or “other parapsychological phenomenon,” it says. And according to Reuters, stigmatised homes typically sell for 10% to 20% less than comparable homes. On the local front, all of this is compounded by the fact that most Malaysians are generally quite superstitious, meaning that anything associated with the dead is considered taboo and should be avoided like a plague! One local property realtor concurs that a haunted house is much more difficult to sell. “It’s a known fact that it will affect the marketability of the property and may even take a long time to sell it. “If it’s known in the market that someone was killed there, the price could be affected,” he says. In a worst case scenario, if your home is haunted, it may never get sold, says VPC Alliance (Malaysia) Sdn Bhd director James Wong. “There are many abandoned houses in Malaysia that are supposedly haunted and have been vacant for a long time because they are difficult to sell,” he tells StarBizWeek. If you happened to own a house that has a macabre past and plan to put it on the market. What can you do to increase the marketability of this supposedly haunted dwelling? A house could falsely be considered haunted due to rumours or inaccurate stories. “Sometimes it’s all just a matter of hearsay. No one may have actually experienced anything eerie, but people just keep talking about it,” says Malaysian Institute of Estate Agents president Nixon Paul. Henry Butcher Marketing Sdn Bhd chief operating officer Tang Chee Meng points out that people can get easily carried away by stories they read or movies they watch. Sometimes, the imagination can play cruel tricks on the mind. If you’re convinced that you have spiritual squatters living with you, get an expert to examine the place. “It’s always best to get to the bottom of things – just to be sure,” says Vincent Liew, a seasoned roof repairman who also does household repairs. If the house you own is looking a little dilapidated, giving it a ghostly appearance, all it may need is some sprucing up or a fresh coat of paint. KL Interior Design executive designer Robert Lee says “a house looks like it is haunted” because of the lack of maintenance. “If your house is overgrown with weeds, cut or trim the bushes. If the wall or fence is damaged, fix it. Some properties are so badly neglected, it can actually look abandoned or even haunted. This won’t boost your resale value,” he says. If, after everything you’ve done and you’re still convinced that the property you have is haunted, then it’s best to get an expert to deal with it. “Getting help from a priest or a medium can help deal with this,” says Lee. 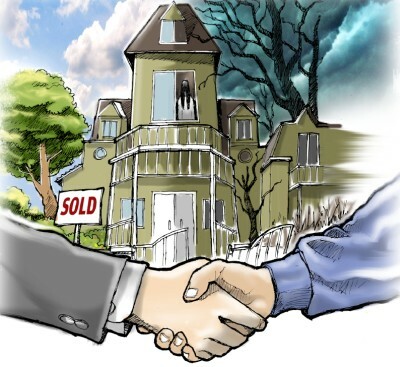 If, after everything you’ve done and your spooky inhabitants refuse to go away, then the next thing you need to consider is whether to disclose to the prospective buyers that the house you’re selling is indeed haunted. In certain countries, such as the United States, it is a legal obligation for the seller to disclose information about the property’s history, for example the house may have been the scene of a gruesome crime such as murder. Fortunately for sellers, no such law exists in Malaysia. “In this case, the doctrine of caveat emptor (which is Latin for “Let the buyer beware”) applies,” says one industry expert. “Here, the onus is on the buyer to do research about the property’s history. There is no onus on the seller or agent to disclose anything,” he says. Kuala Lumpur-based lawyer Dinesh Kanavaji concurs that there is no rule for a seller to disclose that his or her property is haunted. “There is no legal obligation. But then, which seller would want to disclose that anyway? Of course, morally, you should disclose. “Either way, a buyer should do the necessary research first if he’s heard things about the house,” he says. To some buyers, a haunted house may be more of an attraction than a deterrent. “Not everyone is superstitious or cares if a house is haunted. As long as they have a roof above their heads, that’s all that counts,” says one industry observer. “In a hot property market where prices are sky-high, a haunted house, which would fetch a lower price, is more likely to attract prospective buyers in droves – assuming of course they’re not concerned about sharing their abode with some ghostly housemates,” he adds. In an article last year, online business portal Business Insider reported that investors sometimes look to buy a haunted house in the hope of gutting the premises, building a new abode and reselling it for a larger profit. While many believe that it’s detrimental to own a haunted property, whether residential or commercial, some believe that the impact would be lesser if it’s the latter. “If it’s residential property, it will have a bigger impact because people are living there. That’s not the case for retail premises because you’re not living there, so it’s not too much of a concern,” says Richard Chan, past president of the Malaysian Association for Shopping and Highrise Complex Management and national committee member of the Building Management Association of Malaysia. “Of course it does not help if the (commercial) property is haunted, but it’s not detrimental,” he says. Chan adds that sometimes it’s best to not know what you’re buying into. “What you don’t know won’t hurt you,” he says. Another industry observer, meanwhile, believes one has to worry more about the living than the dead. “It’s better to live next to a cemetery than an unruly neighbour,” he says. Is the 3% deposit imposed enough to revive abandoned projects? Recently, it was reported that an amendment to the housing Development Act 2012 will require developers to set aside 3% of the gross development cost to be placed in a fund that will be managed by the Housing and Local Government Ministry. The proceeds from the fund will be used to revive abandoned projects. The Housing Developers Authority (HDA) will only issue licensed permit once the 3% is paid (to be enforced end of this year). It is a good move but the quantum may be insufficient to rectify the problem. The reason being, it all depends at what stage of construction the projects were abandoned. If they wereat 20% completion, then 3% allocation may be insufficient, unless we assume the balance 80% can be sourced from the fund. It remains unclear how the fund works. A check with the Housing Ministry indicates that the 3% allocation can be refunded to the developer concerned if the project is completed. From what I understand, the 3% allocation is then not considered as a contribution to the fund since the deposit is refundable. I fail to understand how 3% can be sufficient unless the completion-to-date reaches 97% development cost (assume also 97% physical completion) and the amount to complete requires the balance 3%. The fund looks and sounds like a fund but in reality, it is not truly a “fund”. Assuming all the developers completed their projects and there is no abandonment, what does it mean? It means all the deposits will be refunded and there will be no money in the fund, so I don’t see how the fund will help other abandoned projects. I used to have a friend in Rehda institute who told me that it had in the past actually kick-started an “insurance” concept where all members could contribute some money into the pool. This money was to be used to help members in the event a project was abandoned. Somehow, it did not take off. There are many causes of abandonment but invariably the developers who cause problems are the ones that are inadequately capitalised to carry out development projects. In other words, they are not financially strong, they rely too heavily on bank financing and buyers to fund their projects. The development risk is skewed towards the consumers, meaning they take bigger risk in the event of a failure. Everybody thinks property development is very profitable and they want to jump onto the bandwagon to make a fast buck. Many do not have the necessary experience and don’t bother to do market studies. The result is that they have a wrong product in a location where there is no demand. Others get into trouble because they are too ambitious and have financially over-stretched themselves. Some of these projects were designed-driven rather than market driven. When a project is abandoned, it leads to legal and technical problems. Reviving abandoned projects is no easy task. In a private free market, white knights (except the Government) will only come in if they can make money upon reviving a project. I have seen cases where liquidators act as developers. But they do not use their own money. They use the fund accumulated from the additional top up from buyers, money in the developer’s account, buyers’ past payments and sale of remaining units. In these cases, buyers waive their late delivery claims. When the Government comes in to help, the objective is different. The motive is not profit but a sense of social responsibility. However, they only focus on low/medium cost projects. I have also seen bridging financiers acting as temporary “developers” who use their own internal fund to complete the projects. They take calculated risk while the white knights will only proceed if the projected result shows viability. Their injection of fund varies, depending on the stages of completion to date. Some are abandoned at 50% completion, some at 90%. There are times when internal funding is inadequate and external funding is required. There is, therefore, no pre-determined amount required to complete an abandoned project. Coming back to the 3% allocation, smaller developers complain of high opportunity cost involved when their money is locked up in the HDA account. Bigger developers are well capitalised and have no problem with the 3% ruling. All developers make provisions of between 3% and 5% for contingency or cost variance. The bigger developers will use the provision to meet the requirement. Smaller developers argue that it is a burden and barrier to entry into the industry. They want to have their cake and eat it too. The problem is, most developers want to fund their projects almost entirely by purchasers’ cashflow. I can understand if they are unable to come up with 100% equity but how about 30% to 40% own capital and the rest from financiers or buyers’ progressive payments? Lastly, what is the level of enforcement by the authorities? What is the point of having all the rules and regulations if they are not enforced? We have cases where developers do not even apply for a developer’s license. Hence, they do not have to pay the RM200,000 deposit for the developer’s licence and open a HDA account. Buyers’ interest are therefore not protected. What guarantee is there that they will play by the rules and pay the 3%? People will circumvent the system if malpractices are allowed to go unpunished. I hope the authority will take a tougher stance to safeguard buyers as well as the industry from the few rogue developers who give the industry a bad reputation. ·Chris Yong is the principal of Rochester Properties. KUALA LUMPUR: Starhill REIT (real estate investment trust) has carried out a revaluation of The Residences which is housed under its portfolio of assets to comply with Clause 10.03 of the Securities Commission's REIT Guidelines. The trust told Bursa Malaysia that the revaluation had been carried out by Azmi & Co Sdn Bhd, an independent professional valuer, on June 8 and would increase the net asset value per unit from RM1.151 to RM1.155 per unit after incorporation of a revaluation surplus of RM5mil.